Though a sense of surface frigidity characterises everything Bronzino produced, emotional heat underwrites his style. As a pupil and adopted son of perhaps the greatest and strangest of mannerist painters, Jacopo Pontormo, Bronzino graduated to artistic maturity with impeccable credentials in that consciously artificial style. That he asserted his own artistic personality, albeit through a steely formality of technique, testifies to the originality of Bronzino's vision. In this magnificent portrait of his principal patron - a work that exists in many replicas and copies - the painter displays a perfectionism it is hard not to think obsessive. Riven with reflections, highlights and shadows, Cosimo's armour alone is an article of transfixing interest: almost reason enough for the painting. It was Bronzino's habit to concentrate on details of costume, jewellery and decoration, to the extent of conceiving the faces of his ducal sitters as polished stones. Apart from this authoritative example, another celebrated version of the work is found in the Uffizi Gallery in Florence. Thomas Holloway, post 11 May 1872, England, Purchased at Christie's London, 11 May 1872, lot no. 302, 'Plon-Plon and the Prince Napoleon'. Sold to Alfred Morrison. Miriam Cosic, The Sydney Morning Herald , 'Wandering Medici finds a home', pg. 4, Sydney, 08 Feb 1996, 4 (illus.). Terry Ingram, The Australian financial review , 'Great art find surfaces in Sydney', pg. 20, Sydney, 11 Jan 1996, 20 (illus.). This article appears in the 'Saleroom' section of the newspaper. Bruce James, Art Gallery of New South Wales handbook , 'Western Collection: Paintings and Sculpture', pg. 17-77, Sydney, 1999, 22 (colour illus.). Heather Johnson, Australian art collector , 'Private Pleasure, Public Gain - the influence of private collections', pg. 58-61, Ultimo, Apr 1998-Jun 1998, 60. Tomislav Nikolic, Look , 'The art that made me', Sydney, May 2018-Jun 2018, pp 23–25: p 25, col illus p 25. 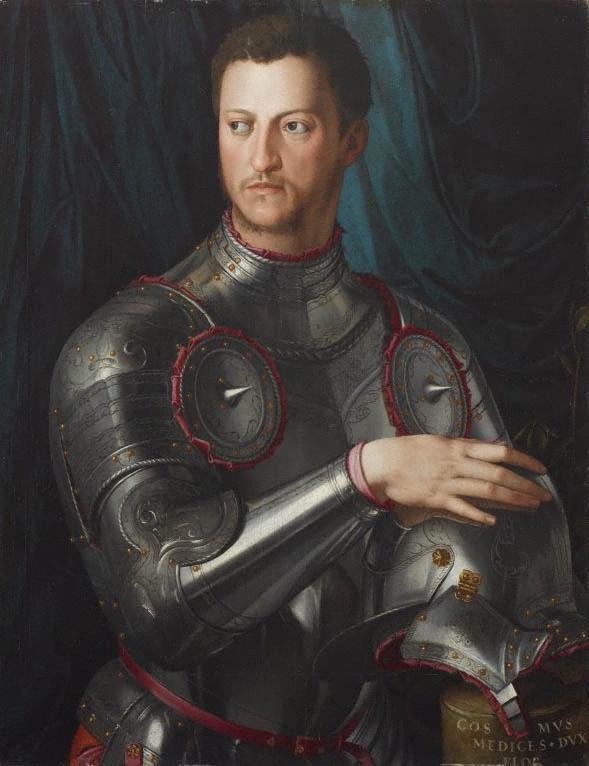 Robert B. Simon, The Burlington Magazine , ''Blessed by the hand of Bronzino': the portrait of Cosimo I in armour', pg. 387-388, Jun 1987, 387-388 (illus.). X-ray images of this work appear on both pages. Michael Wardell, Look , 'Foundation building', pg.14-17, Sydney, Sep 2004, 15 (colour illus.). Art Gallery of New South Wales Foundation Annual Report 1997 , Sydney, 1997, 22 (colour illus.). Art Gallery of New South Wales Foundation Annual Report 1996 , Sydney, 1996, cover (colour illus.). The Australian financial review , '$2.8m for Old Master', pg. 4, Sydney, 08 Feb 1996, 47. The Australian , 'Duke fetches a record $2.8m', pg. 4, Sydney, 08 Feb 1996, 4 (illus.). Daily Telegraph , '$3m art cou, p -, Sydney, 08 Feb 1996, 9 (illus. ), 10. Art Gallery of New South Wales Foundation: Celebrating 30 years of art acquisitions , Sydney, 2015, p 19, col illus p 19. Apollo , London, Jun 1984, 125 (illus.). Look , 'Members events', Sydney, Dec 2015-Jan 2016, col illus p 52. Mémoirs de L'Académie des Inscriptions Belles-Lettres , 1900-1901, 273, 331. The Columbus Gallery , 1893, 15. Como e il Lario commentario , 1795, 33. Elogia vivorum bellica virtute illustrium , 1551, 338-9. Look , 'Welcome back', Sydney, Mar 2018-Apr 2018, p 12, col illus p 12.